Tambussi et al. 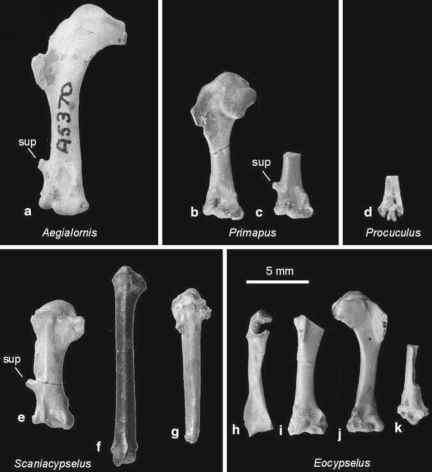 (1994) reported a fragmentary distal tarsometatarsus of a reputed ratite bird from the late Eocene of the La Meseta Formation of Seymour Island in Antarctica (see also Tambussi and Acosta Hospitaleche 2007). Just because of its large size, this specimen certainly comes from a flightless bird, whose weight has been estimated at 60 kg (Tambussi and Acosta Hospitaleche 2007). The fossil differs, however, from the tarsometatarsus of all unambiguous ratites in the unusually large trochlea for the second toe. As there were other large groundbirds in the early Paleogene (see Sect. 6.3), its identification needs to be verified with additional material.